So here’s a little secret for all of you who love the taste and texture of cake combined with hot gooey fudge but who are kitchen averse or who think that all really rich and decadent chocolate desserts require a degree from a fancy culinary school. You know that dessert that all the fancy restaurants serve … the one that they tell you about when you’re first placing your drink order because it takes so long to prepare but it’s so worth it? 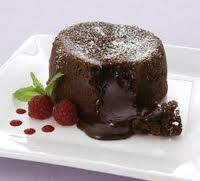 Some places call it molten chocolate cake, or lava cake. It is absolutely luscious, a sheer chocolate delight – and sinfully easy to make. That’s right, all that hoopla about needing extra time is just so much hoke. Restaurants have them pre-made and then they just pop them in the oven … and you can too. Whether you want to surprise your kids with something extra special as a result of good grades or stir up warm feelings in the one you adore, the molten chocolate cake is one of those desserts you can make a fuss about having made, pretend that you slaved over, when it fact it is easy as pie. Well, wait. Pie isn’t easy at all… but you get what I mean. Melt two ounces of the chocolate with the heavy cream in a saucepan. Make sure it’s well blended, then put into the fridge for a couple of hours til it is soft but solid. Form into six balls and put back into the fridge. Preheat your oven to 400 and prepare six ramekins or custard cups (or you can even use cupcake or muffin papers in a pinch) by spraying them well with nonstick cooking spray. Melt four ounces of the chocolate with the butter, then add the eggs, the egg yolks, the sugar and vanilla with a hand mixer until well blended. Beat on medium speed for five minutes til light and smooth, then fold in the flour. Pour equal amounts of the batter into the ramekins, then take one of the prepared chilled chocolate balls and stick it down into the center. Bake for fifteen minutes then remove from oven and let it sit for about five minutes. Run a knife around the sides to loosen or serve directly in the ramekin. Great with ice cream, whipped cream, raspberries. Easy, right? Don’t tell anyone!